Four band bills always appear to offer fans value for money and help to shift ticket sales, but the reality often proves to be something quite different entirely. Once again with an early door opening this evening of much-promised rock and fun started with only a few fans present and interested in making the opening bands slot. The majority of fans instead, I assume, were probably negotiating peak hour traffic either travelling to the venue or on their way home from work. For the opening band then this situation, therefore, offers a bonus of getting to play in larger venues than usual but also probably to fewer people than they regularly do. Thus, it fell to Black Moth to begin proceedings to a mere few punters. I was eagerly anticipating seeing the band for the first time after hearing many positive things about them. Despite the crowd numbers (or lack of) the band did their best to deliver and succinct but powerful and brutally heavy setlist. Kudos in particular awarded to vocalist Harriet who illustrated a variation in vocal tone and pitch in a diversity of song styles and moods. Definitely, a band who deserve a bigger audience and who would be worthy of a future viewing live. An increasing crowd also seemed to be increasingly warm and receptive to the band as their set flew by. Fireball Ministry are a band that I am much more familiar with and indeed have followed their career trajectory for several years. Featuring bass legend Scott Reeder (just google the man’s musical history) I was eagerly anticipating my first live show. The band’s musical groove and style are immediately engaging in that stoner rock sort of style, as crowd numbers had pleasingly noticeably swollen. While a few people around me were clearly loving the huge riffs that thundered over them, the majority of fans in the venue were largely nonplussed by the band’s efforts. I cannot try to explain why the sound was of high quality, the band were giving their all but for some reason, that spark necessary to ignite the crowd was missing. The band’s frontman became more animated and anxious as the set went on in his attempts to fire up the crowd-sadly this didn’t occur. Perhaps they were saving their energies as the night was only halfway through and two more bands to come. 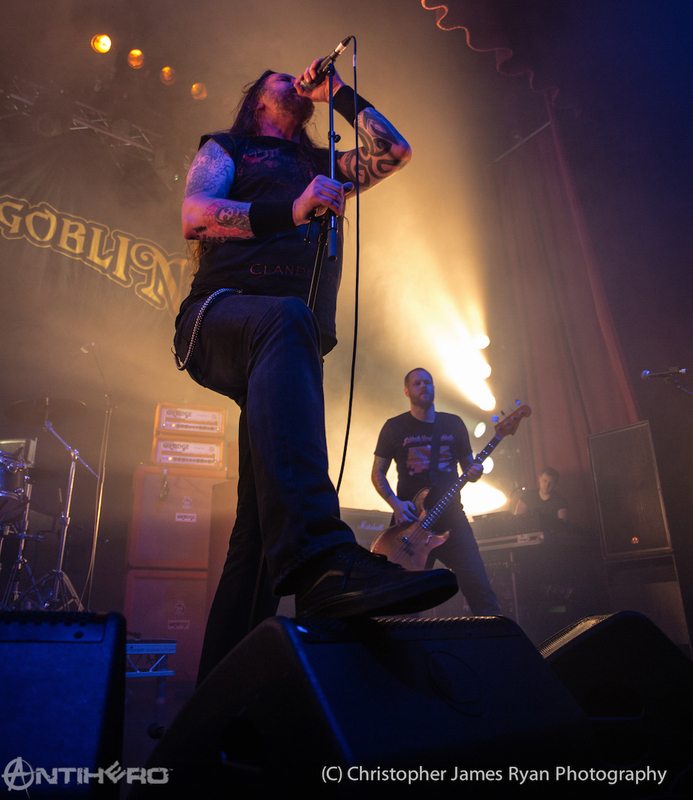 Orange Goblin are a band that I have seen many times over the years and they are always guaranteed to deliver quality and entertainment on a stage. The venue is almost full to capacity as man mountain Ben Ward leads his troops of groove straight into the nights business. Combining a diverse set from their latest release “The Wolf Bites Back” and culminating in early classic Red Tide Rising. Its satisfaction guaranteed, and another job well done by the time that the band exit the set glowing, beaming and dripping in sweat. Worthy of a special mention to the band for sidestepping extortionate venue merchandise markups by selling their merch in local bars of the towns they are touring in. Difficult enough for touring bands to exist and make a living without that particular demand on their income. 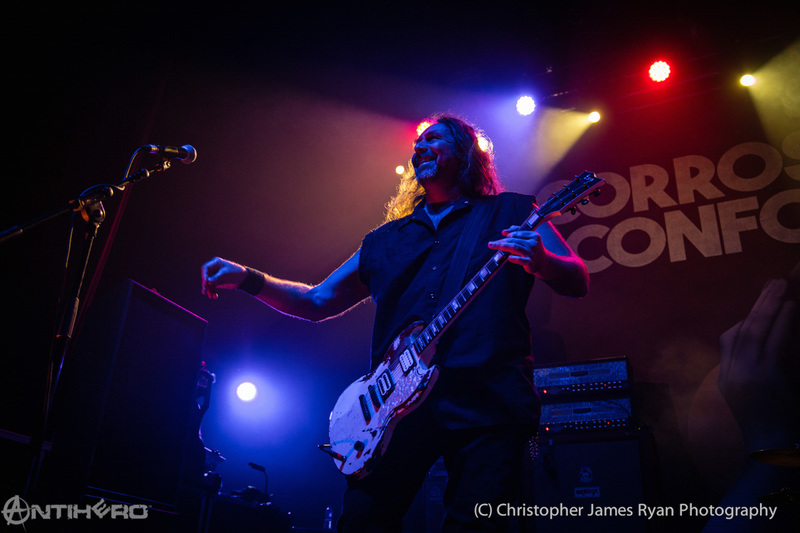 Corrosion of Conformity are a legendary act that have in recent years made the UK a compulsory stop off on each tour that they play. Increasing the amount of UK dates each occasion. they combine a classic song back catalogue, with a simple stage set and prefer instead to just focus on delivering quality in terms of live performance. In a set led by Pepper and also peppered with the obligatory classic anthems like “Clean My Wounds” and “Albatross” (no not that Fleetwood Mac song) the band do just what they do best-laying down a basic heavy groove which has the fans heads nodding in appreciation. Touring to support their latest release No Cross No Crown there are also some newer songs which don’t break any new musical boundaries in terms of style but still deliver in terms of substance…The return of Keenan in 2014 has restored what many fans regard as the band’s classic lineup and that has subsequently ensured that their newest album became the band’s first to enter the Top 100 on the Billboard 200 where it peaked at number 67. Justifiable success for forty years of hard work and many thousands of road miles racked up by the COC guys. No surprises offered up just as expected heavy crushing riffs with a groove. A quality night out with a guarantee of a sore neck come the next day.